Over the last few years, flat roofs have become increasingly popular in Quebec. Wide swings in weather conditions require stronger, top-tier construction. 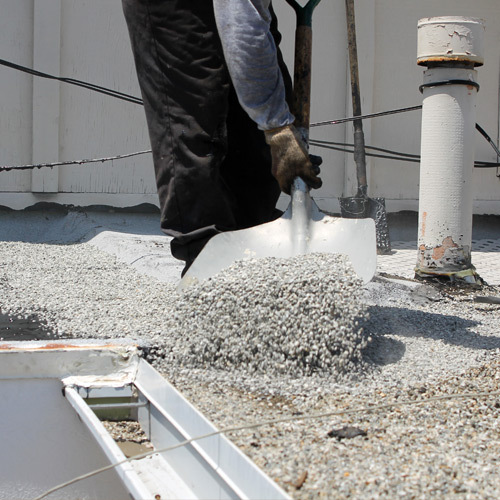 Extreme cold can sometimes damage roofing materials; which is why our team of experts recommends asphalt-and-gravel built-up roofs. This roofing solution is best suited for flat and low-slope roofs. These roofs are made of several layers of felt saturated with liquid asphalt between each layer. The gravel finish on top blocks sunlight, which otherwise accelerates aging of the asphalt. It also helps to slow contraction during sudden temperature shifts. Built-up roofs are relatively affordable and low maintenance, and yearly inspections help to prevent unpleasant damage. This type of roofing can last 20-25 years. White gravel is also available, depending on your personal preference. In order to get sound advice and make the right choice, call a Toitures PME expert today; we will guide you every step of the way.